This attractive gift bag includes one jar of each of the Handmade Rhubarb and Ginger Chutney with Kentish Cobnuts, Handmade Seville Orange Marmalade with Whisky and Kentish Cobnuts and the Handmade Cherry and Almond Conserve with Brandy. Attractively presented in this fine display bag it again makes an ideal gift for Valentines Day, Mothering Sunday, Easter or at Christmas. The Gift Bag is modestly priced at £19.50. This chutney is an excellent alternative to the potash farm handmade rhubarb and ginger chutney with Kentish cobnuts. It goes very well with all cold meats and cheeses. This attractive gift bag includes one jar of each of the Cherry and Almond Conserve with Brandy, Award-winning Kentish Lavender Jelly, and Seville Orange Marmalade with Whisky and Kentish Cobnuts. This is the first of the Potash Farm nut mustards. It has a great colour with a little chilli and a good crunch. It is excellent with all cold meats and cheeses. 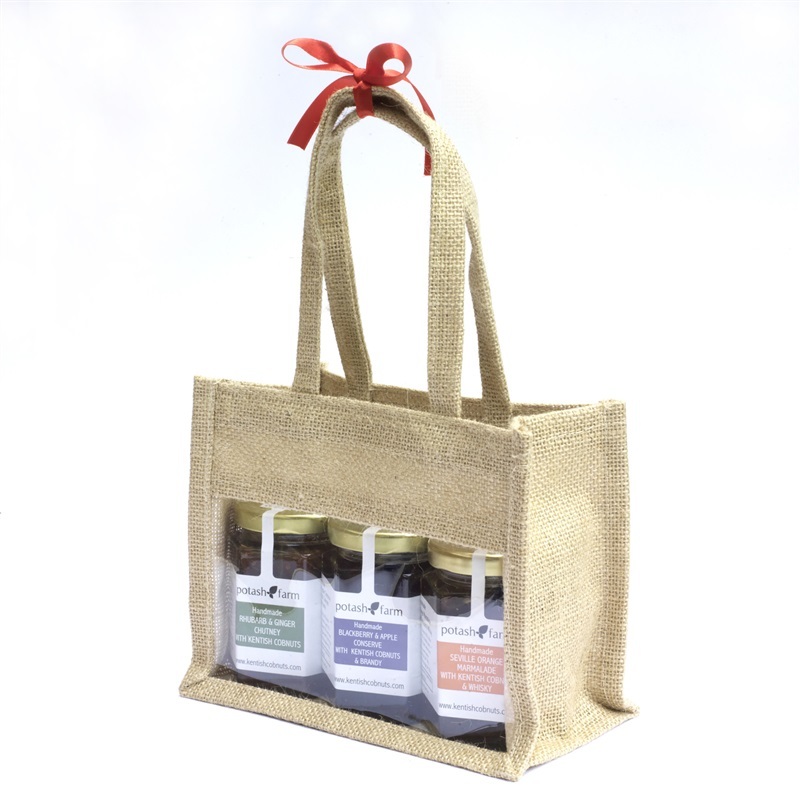 Our hessian gift bag is available to attractively present any three of our jars. This is the first of the Potash Farm nut mustards. It has a great yellow colour with a good crunchy texture. It is excellent with all cold meats and cheeses.